The average American lifestyle is kept afloat by about 2,000 gallons of H2O a day. Your Water Footprint reveals the true cost of our lifestyle. A "water footprint" is the amount of fresh water used to produce the goods and services we consume, including growing, harvesting, packaging, and shipping. From the foods we eat to the clothes we wear to the books we read and the music we listen to, all of it costs more than what we pay at the check-out. The 125 footprint facts in this book show the true cost of our lifestyle and what it is doing to Earth, including draining it dry. The "Virtual Water Concept" shows the amount of water used in human activities. 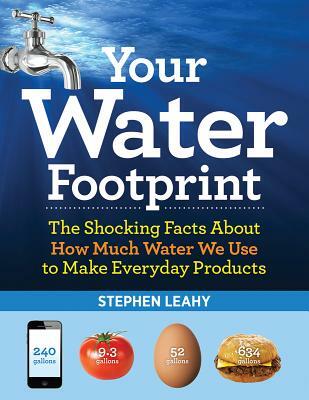 Presented in clever, understandable graphics, Your Water Footprint raises readers' awareness of how much water is used to make the things we use, consume and grow. One pound of lettuce costs 15 gallons of freshwater; mango 190 gallons; avocado 220 gallons; tofu 244 gallons; rice 403 gallons; olives 522 gallons; pork 1,630 gallons; butter 2,044 gallons; chocolate 2,847 gallons; and beef 2,500 to 5,000 gallons. A slice of bread costs 10 gallons but if you eat it with a slice of cheese, it takes another 13 gallons. One glass of beer takes 20 gallons of water, and just one standard cup of tea costs 120 same-sized cups of water. A cotton t-shirt takes almost as much water as beef, a pair of jeans even more. In fact, all aspects of our daily lives require water in some way, shape or form. The saying that "nothing is free" applies more to water than anything else we consume, considering just three percent of the world's water is drinkable and that we are using more of it than ever before. Factor in climate change, population growth and pollution and we have an unsustainable situation. Many experts predict dire water shortages if we continue on our current path. Your Water Footprint is riveting. Consumers of all ages will be stunned by what it reveals. It is an excellent reference and an exciting way to introduce the resource-consumption equation to students. Stephen Leahy is an environmental journalist based in Ontario, Canada. His work has appeared in National Geographic, The Guardian (UK), Sunday Times and New Scientist. He is a senior science and environment correspondent at Inter Press Service News Agency (IPS), the world's largest not-for-profit news agency. He won the 2012 Prince Albert/United Nations Global Prize for Climate Change.